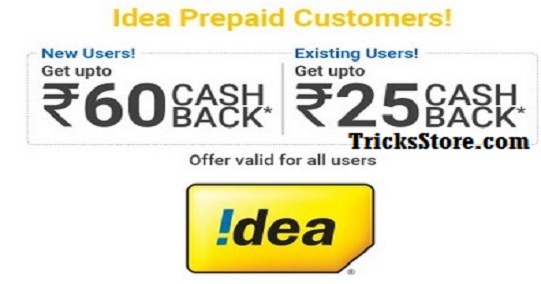 PhonePe App full cashback, Phonepe idea recharge offer, phonepe idea mobile recharge cashback – Hello guys, Now PhonePe is giving back to back cashback offers on recharge. And this time phonepe is come up with idea prepaid recharge cashback. Now Get 50% Cashback upto Rs 60 on First Ever Idea Prepaid Recharge. PhonePe has again come up with an awesome recharge cashback offer, where you will get the flat 50% cashback on First Ever idea prepaid Mobile Recharge. Maximum Cashback is Rs 60 and the cashback Offer is valid only if you Pay the amount using UPI, Debit or Credit card only. So Hurry up guys. 2. Now Just Install & Open the Phone App & Sign up for account. 4. Now On the Homepage Click On Recharge. 6. Pay the amount via UPI or CC/DC only. Hurry !! Just wait You will get flat 50% upto Rs 60 Cashback instantly in your phonepe wallet. * What is the offer? * What is the eligibility criteria? * What is the offer duration? > How many times can this offer can be availed? > Offer can be availed only once per PhonePe registered user. * When do I get the cashback / benefit? > Cashback will be credited into your PhonePe wallet within 24 hours of successful completion of the transaction. > What happens in case of refund/cancellation of my Transaction? > Once the Recharge is Processed, it cannot be cancelled or returned. > Refunded amount less of cashback will be credited to the PhonePe wallet and will continue to be withdrawable to your bank account. * Cashback credited to a user cannot be withdrawn to any linked bank account or transferred to other users. * PhonePe has the right to amend the terms & conditions, end the offer, or call back any or all of its offers without prior notice. * In case of any dispute, Phonepe reserves the right to resolve the same as per the Terms & conditions of any offer at its sole discretion. *In case the PhonePe wallet limit for the month has been reached(₹10000), the cashback will be credited on the first business day of the next month.